Shop our signed West Ham football memorabilia. Signed West Ham shirts, footballs, photos and mounted displays all autographed by the team’s players. Many with signing proof. All with a certificate of authenticity (COA), fast worldwide shipping & free UK delivery! Premier League heavyweights West Ham United have competed within the top tier of English football for over 100 years. They have won the FA Cup three times and are one of just eight clubs to have never fallen below the second tier of English football. They have spent 60 of 92 league seasons in the top flight. Fiercely loyal fans hail from all over the world – although most can be found in their native London. The Hammers started out life in 1895 as Thames Ironworks – they became West Ham United five years later. Glory for the club didn’t come in earnest until the early sixties when they claimed two major trophies including an FA Cup win in 1964. The infamous 1966 England World Cup win was largely fuelled by West Ham players – including captain Bobby Moore and Geoff Hurst, who scored the first and only hattrick in a men’s World Cup final. Ups and downs ensued after such significant triumph – but in 1980 they beat Arsenal to claim another FA Cup win and went on to be promoted to Division One a year later. West Ham’s team colours are claret and sky blue – the crest dominated by a yellow tower which is thought to be a nod to the historic Tudor buildings that stood on the site of their first stadium. For the first portion of their history, they played at the Boleyn Ground in Upton Park, East London before moving to the London Stadium in 2015 after 118 years at their original home. 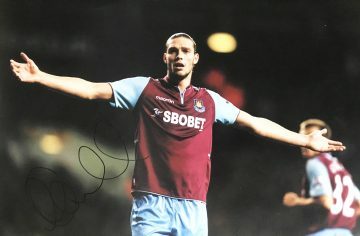 Browse and shop West Ham United signed memorabilia here. At Firma Stella, you’ll find a variety of authentic items, from signed West Ham football shirts and mounted photographs to footballs and goalie gloves. Each product has been fully vetted and verified, issued with a certificate of authenticity for peace of mind.